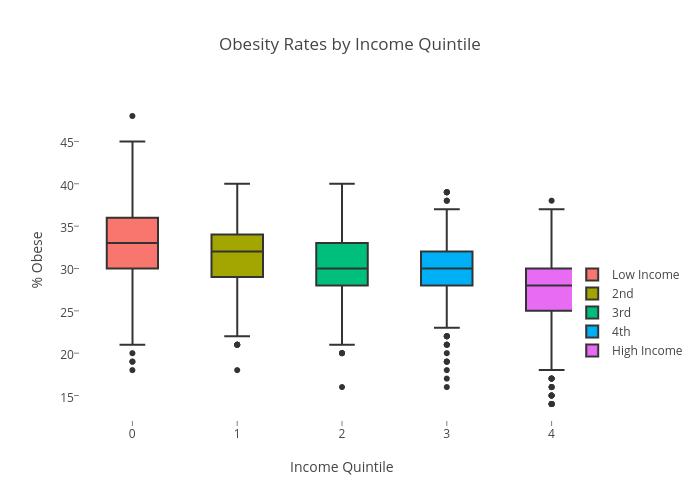 Romanak's interactive graph and data of "Obesity Rates by Income Quintile" is a box plot, showing Low Income, 2nd , 3rd, 4th, High Income; with Income Quintile in the x-axis and % Obese in the y-axis.. The x-axis shows values from -0.5 to 4.5. The y-axis shows values from 12.111111111111112 to 49.888888888888886.